Diana Rattray. The Spruce Eats, 2012. You can serve these cheesy meatballs as an appetizer or main dish. Feel free to add some chopped jalapeno peppers or some ground cayenne for extra heat. 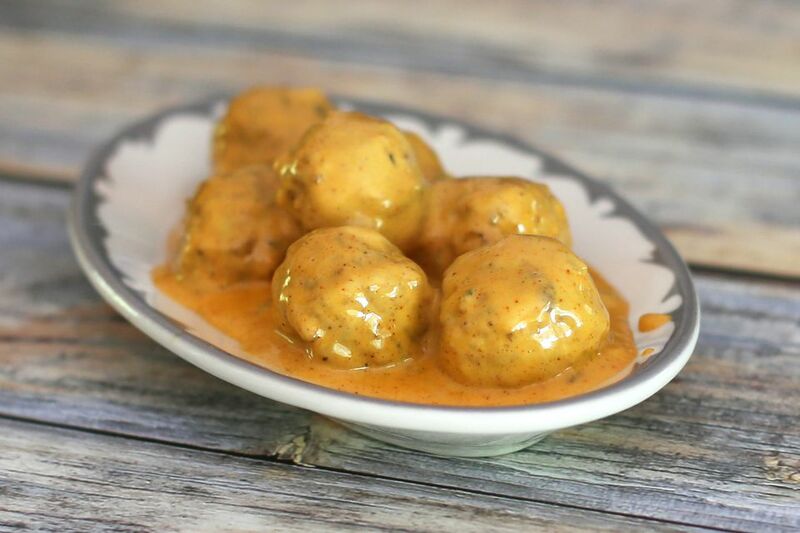 These meatballs are delicious served with rice or lower carb roasted cauliflower. Or make the meatballs small and serve as an appetizer with tortilla chips. Heat the oven to 350 F. Line a rimmed baking sheet with foil. Mix the ground beef and meatloaf seasoning with the egg, 1/3 cup of milk, and bread crumbs. Shape into meatballs and arrange on the prepared baking pan. Bake for 15 minutes, until the meatballs browned. Put the cheese, taco seasoning, peppers, and 1/2 cup of water in the slow cooker. Cover and cook on LOW, frequently stirring until melted. Thin the sauce with more water, as desired. Drain the meatballs on paper towels and then add to the cheese sauce. Cover and cook on LOW 2 to 3 hours. Serve the meatballs hot from the slow cooker.